Westinghouse 395mm width x 1625mm length Freezer Seal. Supplied with Fridge Seal fitting instructions. 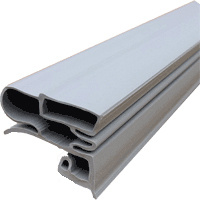 Kelvinator 560mm width x 1325mm length Fridge seal. We supply a more efficiant seal shown below.